It was an exercise in extreme frustration: 10 days of sailing 600 miles against the trade winds, making very little progress on a daily basis. Being in the equatorial latitudes, it was very hot and humid and no air could circulate inside the boat since we had to keep all the hatches closed tight. Water from the choppy sea sloshed constantly over the deck, and once seawater splashes inside a boat, it never dries out. There is nothing worse than sitting—or trying to sleep—on saltwater-dampened mattresses and cushions. Cooking was not an easy chore since it was such a choppy sail, and the stove only intensified the cabin heat. It felt like we were living in a pressure cooker—all shaken and baked. In spite of such unpleasant living conditions, Miguel was a pleasure to have onboard. He fit right in with our family routine and proved to be a saint. With two small boys of his own, he was very patient, helping with the kids, the chores, and the cooking. It wasn’t easy for Sean and Brendan either. They couldn’t go out on the deck since conditions were so rough, and their cabin space was significantly impacted since Miguel’s crates and equipment were stashed there. Halfway through the trip, we all became extremely discouraged. We had reached the same latitude as St. Peter and St. Paul Rocks, but we just seemed to be stopped dead in the water. We could not make any easterly headway toward our destination and Michel’s sextant sun sights kept giving us the same position for two straight days. We just couldn’t beat the odds butting up against the trade winds and the counter current head-on. Miguel even seemed to harbor some doubts of Michel’s navigating abilities. So, on the advice of Captain Michel, we charted a new course due north, a significant distance out of our way, gambling that at an appropriate angle, the current and the winds would assist us in a southerly heading, dead on to our destination. Then finally on day 10, shortly after dawn, bingo!, Michel’s gamble paid off, and we spied the Rocks in the hazy near-distance—but only after Michel climbed the mast to confirm indeed that the “there” was there! We were relieved and elated! Within a couple of hours, the bow of Cowabunga pointed into the very small horseshoe-shaped bay. Waves sloshed around inside the bay like a dog jumping into a tub of water. Somewhat protected by two large pinnacle guardian rocks that faced each other across the narrow entrance, the incoming waves were slightly quelled at this breaking point. Even though these natural jetties somewhat subdued the waves, the swell still rushed into the bay sloshing water from one rocky side to the other. The minimal chart information we were able to procure indicated that the bay should be about 12-15 meters deep, feasible for anchoring. However, our depth sounder consistently indicated otherwise— a depth over 200 meters. Michel and Miguel decided to try and set the anchor anyway—several times in several spots. They repeatedly let out our 60 meters of chain, only to reel it all in again and again. It was useless; the bay was too deep. There was nothing for the anchor to dig into. Now what? There was no beach, no dock, no platform to tie up to. Besides, even if there was enough depth to anchor in the bay, there still wasn’t enough “swing” room within the bay to allow for a safe anchorage. We didn’t sail all this distance under such difficult conditions for 10 days to just turn around and go back. It was time for some creative thinking, and Michel could be very good at that. The trade winds and the current were constant at this time of year, and we could depend upon that; both the wind and the current would always come from the same direction, from east to west. The chances of any change in the direction of the wind were really, really near-to-impossible. So, banking on nature’s cooperation, Michel and Miguel set up two long mooring lines reaching out in a “V” shape from the bow of our boat, from the starboard (right) and port (left) sides, tying up to each of the guardian pinnacle rocks at the bay’s entrance. With the dinghy they motored out and lassoed each rock, thus tethering Cowabunga via these umbilical cords. The constant and regular wind literally kept us at bay and out of danger from banging into the rocks. Even though we had arrived in the early morning, it was an all-day affair before we were finally settled and could finally relax by sunset, savoring a well-deserved calm evening meal while surveying the surreal, eerie scene spread out before us. Perched here on the equator at the mouth of the bay of these pinnacles, we felt like we had a view on top of the world. We all agreed that it must be the closest landscape on earth that could resemble what we would imagine the Moon to be. Not a speck of green was to be seen—no vegetation whatsoever. It was very volcanic: course, dark, lava pinnacles and crags jutting out everywhere, and strangely coiffed with snowy caps—deep and widespread layers of guano. Birds of all types just swarmed around the Rocks. According to some of our information, the Rocks were teeming with bird life while the bay was said to be chock-full of sharks. We could see the bird life everywhere, and soon we would experience it “up close and personal.” We preferred to hope that the sharks weren’t as numerous as rumors held, but we maintained a safe distance anyway: no swimming in this bay. But now, this first evening, just a peaceful meal. Tomorrow’s challenge awaited. The next day, Michel and Miguel set to work. They needed to load the dinghy with the equipment, get on land, and diagnose the wind recording station’s malfunction. Getting on the Rocks was not a piece of cake. There was no beach or flat surface to land the dinghy. It was all rocky cliff, with only one small viable spot sporting two small natural “footholds” that were literally moving targets under the constant heaving swell crashing on the rocks. Miguel and Michel would have to gingerly balance themselves on these footholds with just enough of a reach to place equipment at an arm's length on the flat surface just above the cliff’s edge. They spent most of this first day making trips back and forth between Cowabunga and the cliff footholds, loading and unloading equipment in a delicate dance of “balance-heave-ho” all while gauging the swells. Miguel was finally able to set up a working base at the foot of the wind recording station by late that afternoon, and began a process of determining what the problem, or problems, could be. The station itself wasn't very elaborate, but given this was only 1984, it embodied rather sophisticated computer and satellite technology for the time. Basically a wind vane atop a simple pole relayed information to a computer at the base of the pole, communicating that information to a satellite twice a day. This information was then relayed from the satellite to the Lamont-Doherty Geological Laboratory at Columbia University in New York. Every evening we would call a Ham radio contact person with our pre-arranged appointment. He would “phone-patch” us in to the Lamont-Doherty laboratory whereupon Miguel and his colleagues would collaborate to decipher the information that had or had not been transmitted that day. This process went on for about five days and Michel assisted Miguel when and wherever he could. 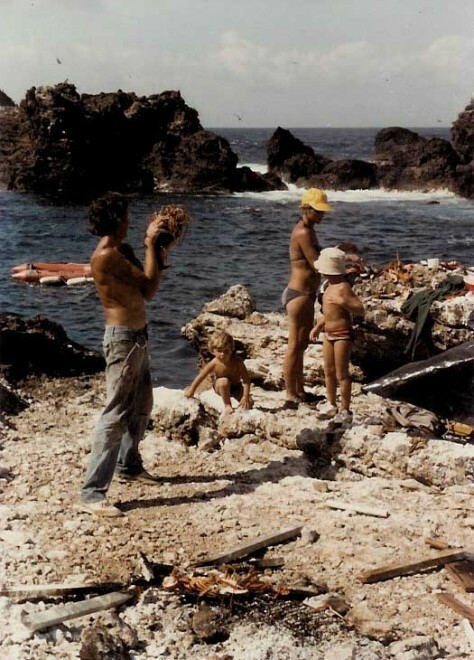 The kids and I were anxious to go on land and explore this savage and intriguing environment, especially after having been confined to the boat for the 10-day sail here. As it happened, the second day was my thirtieth birthday, and we all decided to celebrate it on land with a unique barbecue, if we could. Among the hearty bounty of bird and fish life here, legend also had it that lobsters were quite plentiful due to the rocky environment and being devoid of fishermen. We had brought along a lobster trap just in case, which Michel had already prepared and set in the water the day before. Attempting a landing with the dinghy, especially with our two small boys, involved careful, tricky footwork. But Michel and Miguel were old hands at the procedure by now. Once we all managed to heave ourselves and the boys over the rocky ledge, it was indeed eery—and breathtaking. A rocky plateau spread out before us, dotted with innumerable tidal pools. The plateau bristled with a gleaming carpet of peculiar one-armed crabs, winding around and around waving their single “menacing” claws (which were actually quite cute). Occasional flying fish that had flown too high and dry dotted the rocks. Spectacular and noisy waves crashed over the cliffs, rocks, and pinnacles, and our view of the landscape from the boat was confirmed: there was no vegetation whatsoever. True to their reputation, the bird population was large and aggressive. They attempted to overpower and threaten us, having no fear of humans, since they rarely had contact with such a beast. They would rush, dive-bomb, and cackle at us. With quite a few young ones in nests, some had even more acute aggressive behavior. After a while, we all seemed to reach an acceptable truce as a certain invisible barrier was established. One step beyond that frontier and they relaunched into attack mode. The unbelievable surprise and joy of the day was the lobster trap catch: 30 lobsters (really!) for my thirtieth birthday! It was quite amazing. Not only did we feast on them right then and there, but I had my job cut out cooking and preserving as much as I could for future meals. We explored the surroundings as much as we could: twisted and rusted iron remnants of an old abandoned lighthouse, commemorative plaques of the few ships that had passed this way over the years placed at the base. We added one for “Cowabunga” to this unique and privileged collection. It was fun to watch Sean and Brendan be so inspired by these surroundings. They, of course, were used to the water, isolated beaches, tropical anchorages, and unique natural settings. But even this was quite different for them as well, and they were enthralled poking around the tidal pools, learning to respect the birds and crabs who weren’t afraid of them. We spent the entire day on land, taking it all in since it was doubtful we would return due to the vicarious landing situation, which coincidentally soon deteriorated after a few days when the waves and swell deepened and worsened. Like the birds and crabs who were so abundant on land, so indeed were the sharks, lobsters, and other marine life below the surface. From the deck, we continually saw large dark figures darting underwater all around the bay, confirming the presence of sharks. One moonless evening after dinner, inspired by a bit of mischievousness, Michel decided to shine a powerful light projector onto the surface of the water. The effect incited a flurry of flying fish to jump out of the water, landing all over the deck. They were big, measuring 10-12 inches long—the largest flying fish we had ever seen. This set into motion a chain reaction as the sharks became crazed and rallied after the flying fish. The water churned with their blind fury as they rammed against the hull of the boat. It was pretty chaotic: showers of fish jumping around, and the “thud, thud, thud” of sharks ramming the hull. Then Michel and Miguel took it one step further, deciding to play “chicken” and somewhat taunt these underwater phantoms. They loaded an industrial-grade fishing line with a 3-4 inch long heavy-duty stainless steel gauge hook, sporting a flying fish as bait. They affixed the line to a winch and large deck cleat. It didn’t take long for the first shark to strike the bait. Michel and Miguel started to slowly reel it in with the winch and just as it was about to come alongside the boat, the shark effortlessly broke the line with a sudden jerk. They repeated the “fishing” process several times with the shark easily taking the bait each time, letting itself get slowly reeled in and then with a sudden and brisk “wham,” it broke away—hook, line, and sinker. It was an evening’s entertainment, yet a vivid reminder of the power nature wielded in this isolated spot of the world. Sean was developing a passion for fishing, and was becoming quite adept at handling the cast net we had. Abundant schools of fish scurried around the boat and Sean found that if he simply threw some cracker crumbs overboard, the fish crowded around to gobble them up. Then he would just throw the net on top of the churning group, catching plenty of fish daily to fulfill all our needs. It seemed forever, and then suddenly Michel popped back out of the angry foam. His glasses were gone and he was pretty bruised and cut up having been mashed against the rocks underwater. Later he confided that he was sure that was the end. He and Miguel did manage to set the line properly on a second try. It was a sobering experience and we vowed from that moment on that any further visits to the Rocks would require wearing lifejackets (a stupid oversight up to then). We stayed a total of five days, finally leaving hastily as the anchoring situation seemed to become more precarious every day. I didn’t dare let the boys out on deck. The boat was rocking violently and I couldn’t risk either one of them losing their balance to the awaiting sharks below. Miguel decided that there wasn’t much more he could do on the station, and although thrilled to have discovered this unique spot, and conscious that we were only a few of the handful who had been here, we anxiously threw off the ties that bound us, and made a speedy five-day sail back to Fortaleza. After the 10-day slog uphill to get to St. Peter and St. Paul Rocks, the return trip was a breeze—all with a comfortable downwind angle. We learned a lot from this trip: what we were capable of handling, what nature can hold in store, and overcoming difficult odds. With no GPS (since it didn’t even exist then for the public), nor a Sat Nav system—as was the new gadget at the time—Michel achieved his personal best with good old traditional navigational skills and a sextant, guiding us to that needle in the haystack. With the tragic disappearance of the Rio de Janeiro-Paris bound Air France Flight 447 over these waters in June 2009, our thoughts returned to St. Peter and St. Paul Rocks, and the hostile environment it was, and is. But we were lucky to return.